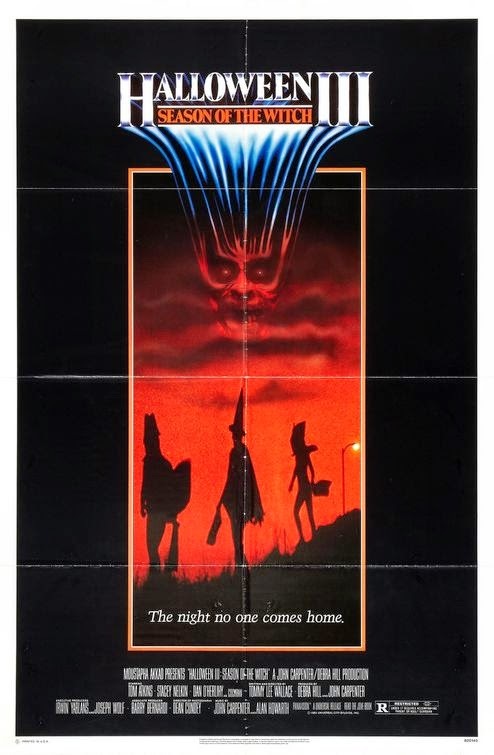 Tag line: "Witchcraft enters the computer age, and a different terror begins"
Many fans of Halloween and Halloween II never warmed up to 1982’s Halloween III: Season of the Witch. The reason, of course, is that, unlike the previous films, soulless killer Michael Myers is nowhere to be found. With Halloween III: Season of the Witch, executive producers John Carpenter and Debra Hill were hoping to launch what would have become an anthology of sorts, with a new Halloween movie, each telling a different story, released every year around the holiday. It was a great concept, and I kinda wish they’d had a chance to expand upon it. Unfortunately, it wasn’t to be. Several days before Halloween, Dr. Daniel Challis (Tom Atkins) is pulled into a bizarre mystery when an elderly patient, who was brought into the hospital clutching a Halloween mask, is murdered while still under his care. Joined by the dead man’s daughter, Ellie (Stacey Nelkin), Dr. Challis heads to the small California town of Santa Mira, the headquarters of the Silver Shamrock Company, producers of the hottest Halloween mask on the planet. Thanks to their intensive marketing campaign (which includes a jingle you won’t soon forget), Silver Shamrock has sold millions of masks all across the United States. What’s more, they’re telling kids to tune in to a special Halloween night program, which they should watch while still in costume. But as Dr. Challis and Ellie probe deeper into the matter, they discover the CEO of Silver Shamrock, Conal Cochran (Dan O’Herlihy), is plotting something that, if successful, will result in the deaths of thousands, possibly even millions, of innocent people. Aside from a few brief scenes where the original Halloween is playing on TV, Halloween III has no tie-in whatsoever with Michael Myers, Dr. Loomis, Laurie Strode or Haddonfield, Illinois. Yet, despite its differences from the first two entries, Halloween III is a fun film in its own right. Sure, it’s not perfect (there’s a link to Stonehenge that doesn’t make much sense), but the movie boasts a handful of noteworthy scenes, the best of which is a sequence where Cochran tests his devious plan on the family of Buddy Kupfer (Ralph Strait), a salesman who, because he sold so many masks, was given a V.I.P. tour of the plant. After being placed in a small room, Buddy’s son Little Buddy (Brad Schacter) puts on his Silver Shamrock mask and watches the program scheduled to air on Halloween night. Needless to say, things get a bit out of hand, and the resulting carnage is something you won’t soon forget. Also memorable is Conal Cochran’s history lesson of sorts, where he discusses the true origin of Halloween (flawlessly delivered by O’Herlihy, it proves a fascinating monologue). Admittedly, I’m a fan of the Halloween series, including the movies that followed Halloween III, all of which once again featured Michael Myers (Halloween IV: The Return of Michael Myers and Halloween V: The Revenge of Michel Myers are both solid horror films). That said, I can’t help but wonder what stories might have been told had Carpenter and Hill had a chance to continue their initial plan for the series. I don’t blame the fans, really, for not embracing Halloween III: Season of the Witch. For me, the fault lies with whoever decided to add the number “3” to this film (which led people to believe it was yet another sequel to the classic original). It’s all water under the bridge now, of course, but the fact that I enjoyed Halloween III: Season of the Witch makes the failure of Carpenter and Hill’s concept a little harder to bear. Congratulations. This is an impressive milestone. Thanks, Jared! I appreciate that! I haven't seen this one, but it's one that my brother has told me more than once he thinks is far better than its reputation. This movie is so much fun. The 'little Buddy scene' is so insane and one of the most mean spirited sequences in a mainstream horror film but it totally works. O'Herlihy is so good in this movie. I think he's always overlooked when people discuss the best Horror villains. And of course Tom Atkins; I actually prefer this to "Night of the Creeps," but that's not slam on "Creeps." Recently discovered the blog and really enjoying going through all the reviews. Congrats on hitting 1,500. What an awesome movie to hit that milestone with. @SJHoneywell: Yeah, can't believe I've made it to 60%! Time hs flown. And I definitely agree with your brother!